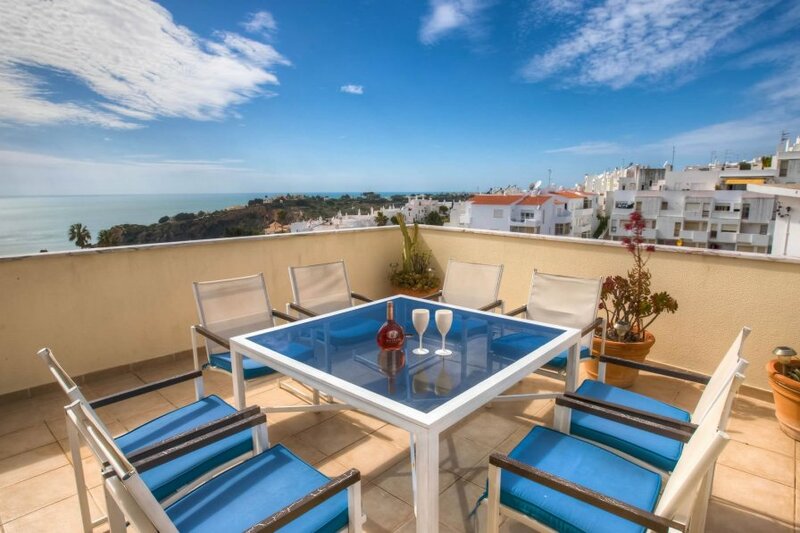 This large 2 bedroom apartment with air conditioning and magnificent sea views is perfect for a family, or group getaway due to it's close location to Albufeira, and being 500m from the beach. This stylish modern apartment is beautifully furnished throughout with a large living room with amazing sea views. There is a TV, DVD player and patio doors to the large terrace. The modern kitchen is a great size and fully fitted with all modern conveniences such as Kettle, Toaster, Dishwasher, Cooker, Microwave, Fridge, Freezer, and Washing machine. It has a useful breakfast bar and doors to the terrace, perfect for alfresco dining. There are 2 large bedrooms, one with en-suite shower room and both with fabulous sea views. Hair dryer is provided. There is an additional family bathroom. An iron and ironing board, plus clothes dryer, are also provided making this apartment also suitable for a long winter stay, as well as a summer holiday. AIR CONDITIONING AND WI-FI ARE INCLUDED IN THE RENTAL PRICE. There is secure parking and lift access. Accommodation for further guests can also be arranged in other similar apartments in the same complex if required. Living Room - Modern, stylishly decorated dual aspect room with large comfy sofas. Flat screen TV, DVD Player, and Air Conditioning. Patio door access to balcony/terrace with modern comfortable outdoor dining and lounging furniture. Kitchen - Fully fitted and stylish with modern appliances. Electric hob and oven, fridge/freezer, washing machine, dishwasher, toaster and kettle. Breakfast bar. Doors to terrace. Bedrooms - Bedroom 1 with sea view, fitted wardrobes, ensuite shower room and doors to the terrace. Bedroom 2 with sea view, fitted wardrobes and doors to the terrace. Bathroom - Ensuite to Bedroom 1 with shower, WC, and hand basin. Family bathroom has bath with shower over, WC, bidet and basin. Other - Private terraces with outdoor dining and lounging furniture. The spacious main terrace has outdoor dining table & chairs and sun loungers enabling you to make the most of stunning sea views. There is also a smaller terrace adjoining the bedrooms, again with comfy lounging chairs and a compact dining table & chairs. The apartments large communal swimming pool is surrounded by a large terrace. Complimentary sunbeds and umbrellas are provided - a great place for relaxing! The nearest sandy beach is just a 500 metres stroll, and the vast array of shops, stylish boutiques, bars and restaurants of the Old Town are within a few minutes walking distance. There are some wonderful beaches close by. In addition to the large golden beaches, there are more intimate beaches such as those at Sao Rafael and Castelo. The coastline is spectacular with great views and great walks. The nearest golf course, Victoria Golf Course, is 7 km from the apartment. Many other courses such as the Balaia Golf course (nine holes), Salgados Golf Club, and Pine Cliffs, Golf and Country Club are a short drive away. Discounted green fees and special packages are available on many courses. The lively main town of Albufeira is just a few minutes walk, with its abundance of shops, bars, restaurants and beaches, but there are friendly bars and restaurants very close by, so there is no need to venture into town every night. Albufeira is approx. 40 minutes easy drive along the coastal motorway from Faro Airport. Care hire is recommended in order to visit many interesting places. There are supermarkets, bars, restaurants and shops a few minutes walk away in the centre of Albufeira Old Town. The big supermarkets, Modelo and Lidl, are a 10 minute drive. Albufeira has an abundance of bars, restaurants and shops. There are many banks and cash withdrawal machines. There are two big water parks. Slide and Splash about 25 minutes drive, Aqualand is 20 minutes drive, and Zoo Marine for the whole family within 15 minutes drive. The Algarve Shopping Centre is also 15 minutes drive with its great High Street shops and restaurants.